Giveaway Winners and a freebie for all! The last of the Christmas Creations! Kitties get an early Christmas! Free Christmas Cross Stitch Patterns! 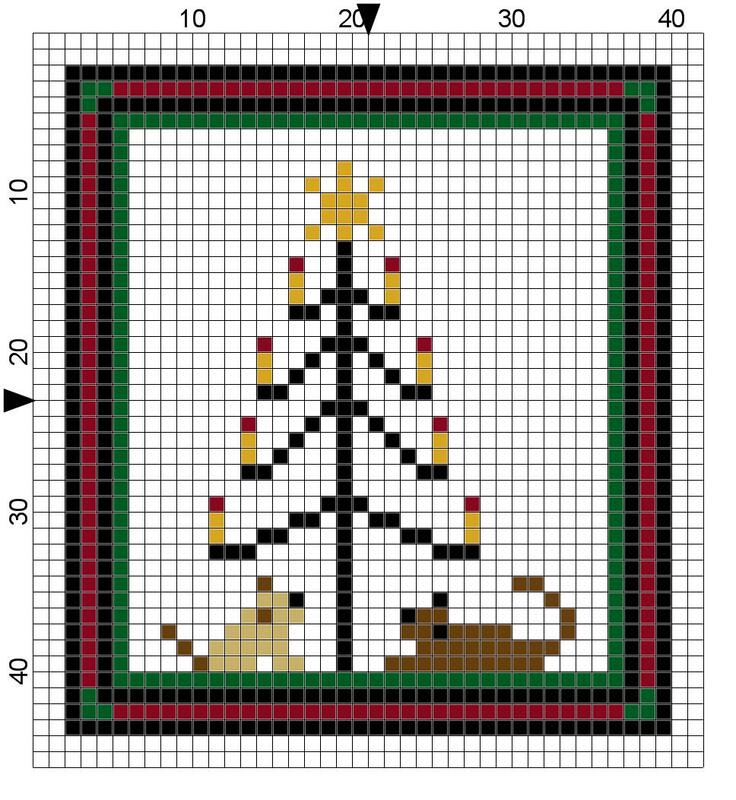 Christmas quilt, punch needle and Izzy! 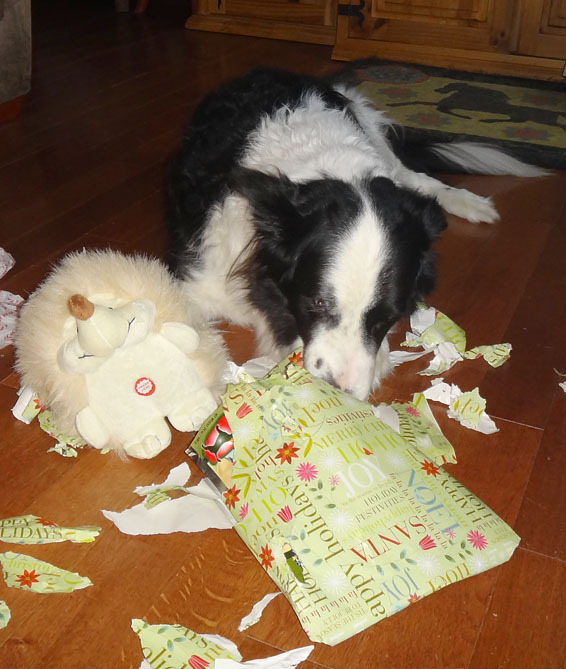 I hope everyone had a wonderful holiday and have a Happy New Year. For me, this year is the year to finish projects, I have started and create with all of the wonderful prizes I have won and gifts given by friends. 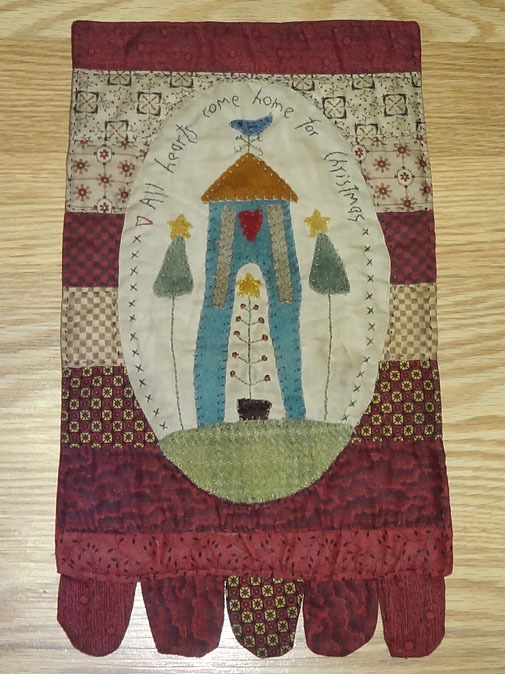 I am truly blessed and plan to make time to make time for myself and for charity quilts this year. 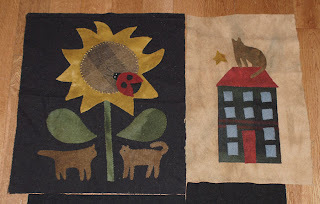 I looked in my old files and only saw one photo of a couple of blocks, so I will share a few more tonight and later when they are all embellished, I will do a group shot and progress. I have no idea what I am doing, just making them, sewing them and seeing what becomes of it. I hope that all of you and your families have a wonderful New Year that is filled with blessings. 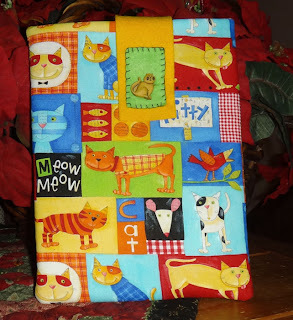 The blocks are made from various patterns in books and a bit of my own, no one designer, I just used what I like. I really enjoyed reading everyone's comments and suggestions. I do love to create and it will give me ideas to play with and maybe some new patterns in the coming year. One of my gifts this year was an ipad 2, and I got an app called Sketchbook pro. You can get it as a free app with basics, or this week it is only 1.99, well worth buying, it is a wonderful drawing and painting program. My son and DIL got me a nice stylus, so now I can practice drawing with it. I used the random number generator and the winning number for the Valentine prize package was number 15, Robin of Bird In The Hand Primitives! 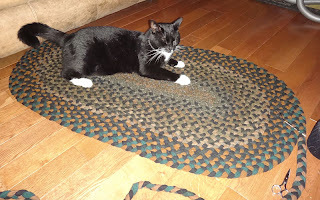 Be sure to visit Robin's blog, she has wonderful free patterns. 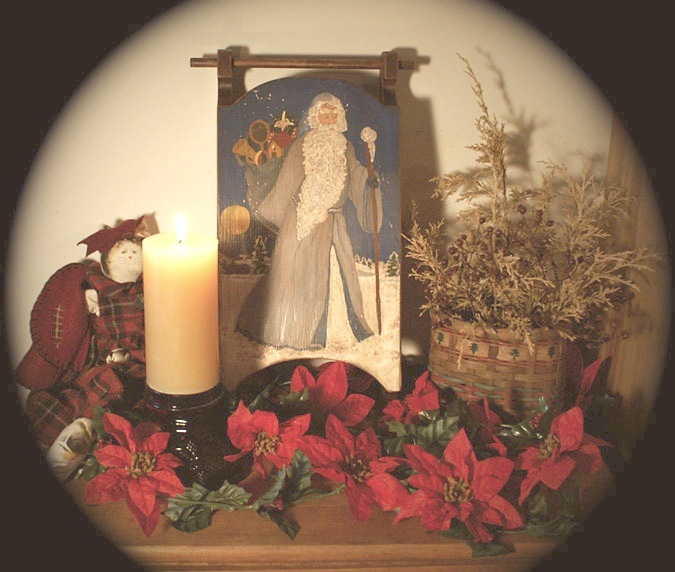 And for the second winner, a choice of two epatterns or booklets, is number 13, Dorothy of Dorothy's Threads of Life! Robin, please send me your address so I can mail you goodies to you and Dorothy, you can go to my ecrater site and pick out any two epatterns, congratulations! And for everyone else, a gift for you to enjoy. 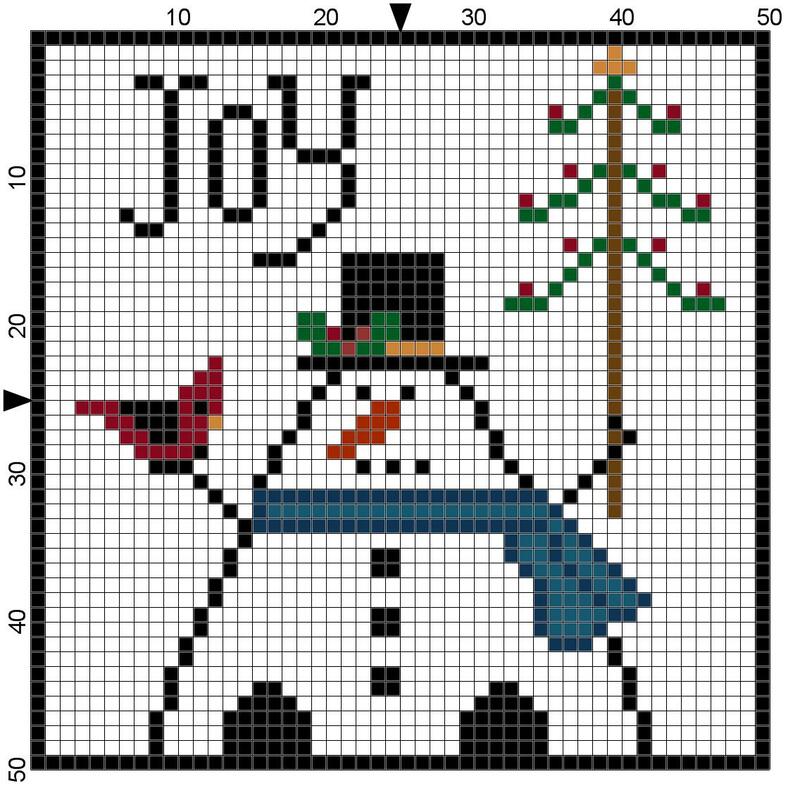 This is a pattern that I made and was planning on making an epattern from but never had a chance, so today I am sharing the cross stitch pattern with you. I hope you enjoy making it and I always enjoy seeing your finished pieces. 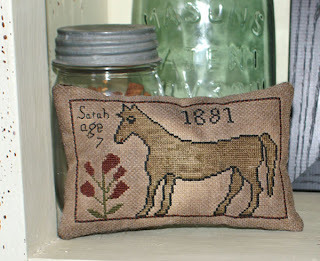 For the horse on my piece, I used dmc linen, #4145. For the mouth, I used a line of floss. Giveaway ends at midnight tonight, see posting below! 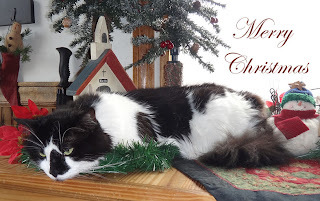 I want to extend a Happy Christmas and a Happy Chanukah to all of my online friends. I hope you are all well and with family and friends and may the new year bring blessings to you all. I feel blessed to be able to call all of you my friends. I decided to do a Valentine theme for the giveaway, it is right around the corner. The winner will receive my little valentine quilt, some of my hand dyed thrift wool, fat quarters and a little cross stitch kitty. A second winner will receive a choice of any two of my epatterns. The giveaway starts tonight and ends on sunday, at midnight, eastern time. I will announce the winners on Monday, the 26th. So what do you need to do to enter? First, this is for followers only, new followers are always welcome. 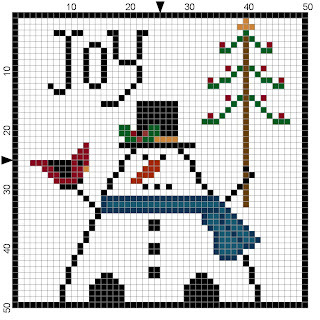 Tell me what crafts you like to do and what types of patterns you would like to do, but can never find, and would like to see. What themes or subjects would you like to see. I wanted to show you a really special set that my friend Kelley sent me for Christmas. 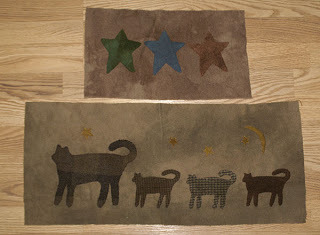 She hooked this pillow set and I just love it, so different and unique. 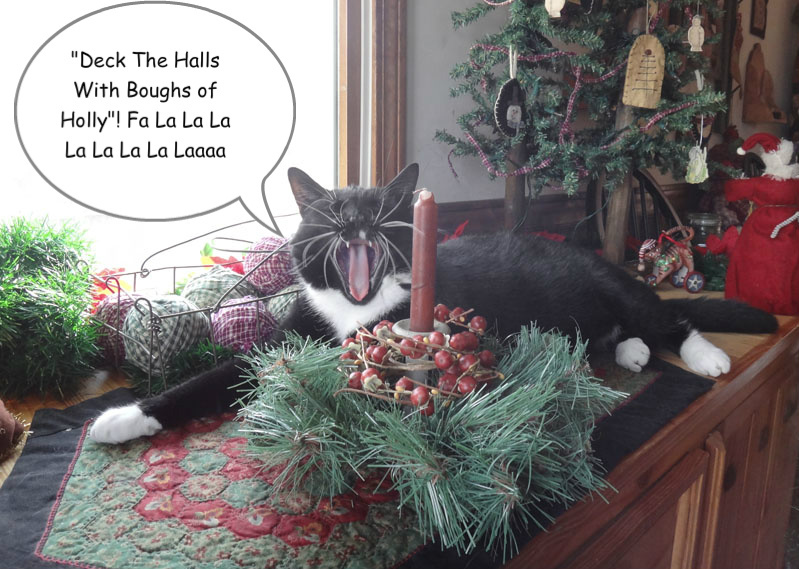 I put it up with my kitties for now, but after the holidays, I will do a nice display with it. I came on this morning and saw that I now have 300 followers. Have no idea why anyone wants to read my dribble, but I do enjoy and appreciate all of my followers and the wonderful comments. So, I guess in honor of my 300 followers and all the giveaway goodness that I have received this year, I will be having a giveaway tomorrow. For those of you who ask me a question and have a no reply, I cannot answer you. This year I need some me time, still fighting off symptoms and I have my good and bad days, but at least I have good days, so I take that as a hopeful sign, that someday I will get better. I want to work on new patterns and creating, so look for new things this year. This is a sled I painted a long time ago. It had gotten dirty in the basement, so I cleaned it up and antiqued it a bit. His beard was done with textured snow paint. I made up a couple of small things this week to have in case I have unexpected company. The appliques I used for the pillows are from Cheri Saffiote Payne in her older book, 301 Christmas quilt blocks. 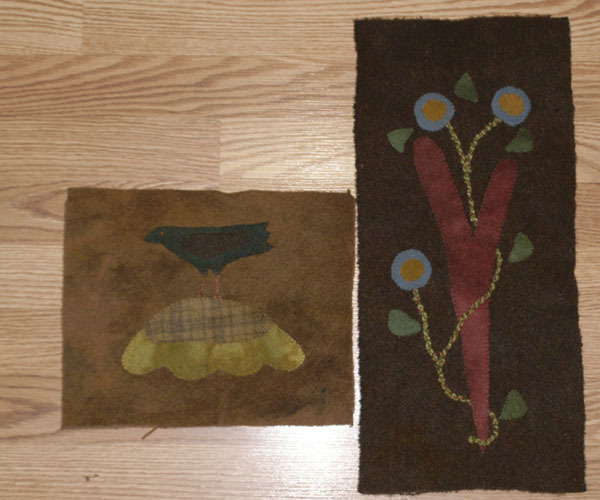 You can still get copies of her two older books on ebay for good prices, and they are great for making gifts as well as some beautiful projects, that I will make someday. These ornies I made up from a pattern on Create and Decorate. 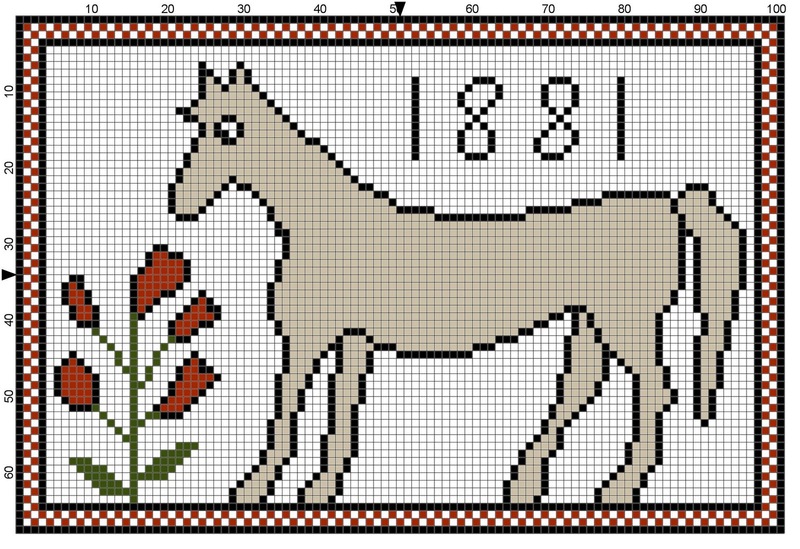 I found the pattern in their section for pattern corrections. It was for additional snowflake patterns in the December 2011 link. I used the snowflakes and made up some more penny ornies. I liked the patterns on these, nice designs to do up and a nice idea for next year, to add one inside a card or to a package. We got Casey a present and a new bird feeder and seed and the kitties got an early present. 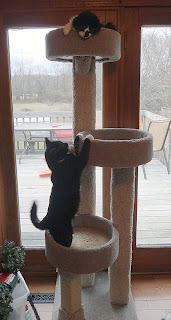 At first Moki was afraid of it, had no idea what it was, but Izzy dug her claws in and started climbing. 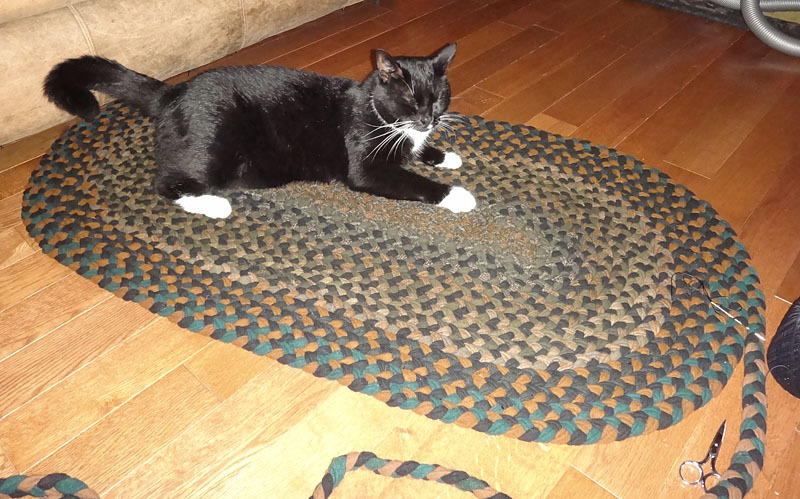 Once moki realized it wasn't going to attack him, and saw Izzy having fun, he had to join in. 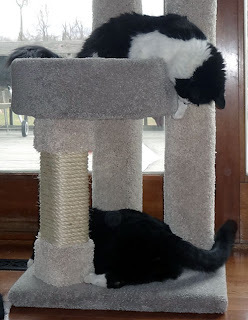 Once Moki got into the game, Izzy found she could reach the top and hide from moki. I hesitated showing my new piece, the flash really did a job on the colors and look. 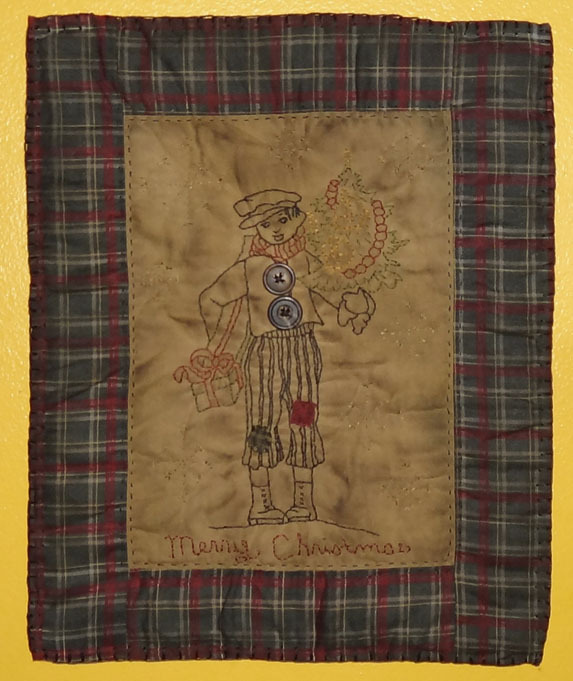 I made this stitched piece last year and put it in a frame, but I wanted to make it into a mini quilt. 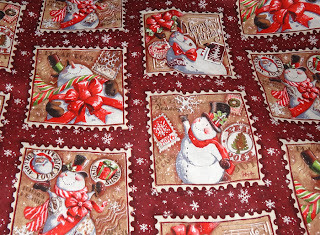 I decided to go with plaid for a border, just seemed to fit the look and then I added stitched snowflakes. I did a blanket stitch around the outside, but it is hard to see, I really need to start using my good camera and learning how to use the functions. The stitchery is a vintage design I found on the web and I added the snowflakes and saying. It seems Christmas decorations make the best places to sleep on, as you can see. And the minute Moki leaves, Izzy takes over. 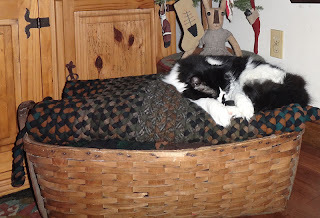 Today I was busy sewing up pillows, antiquing and stuffing. I wanted to make some pillows stuffed with crushed balsam to put into packages, so that is what I did. 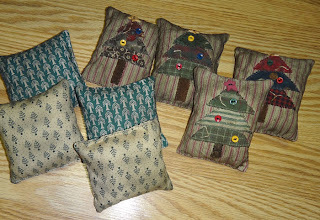 I had the tree applique made first and today I finished those and made some quickie pillows. 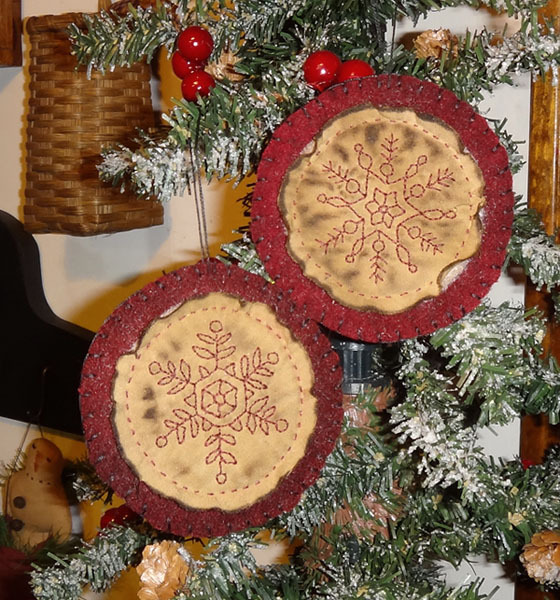 The tree appliques are fun to make, quick and easy, just cut up scraps of triangles and whip stitch them onto a backing. I used wool for the stem. I got some buttons to add to the trees. 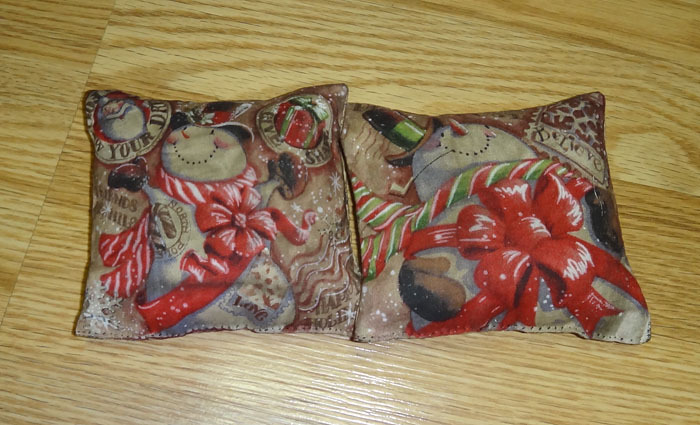 The other pillows are some old and some new christmas fabrics and I stained them to age them. These pillows I made with fabric I found at Jo anns. I thought it would be fun and faster to use pre printed fabric, but I didn't realize that the designs are a bit skewed, but I tried to sew them straight, so they didn't come out too bad. I aged these, as well. 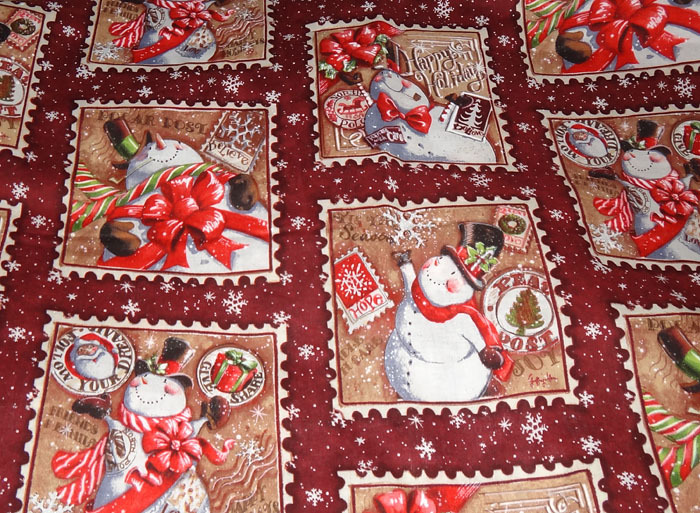 This is the original fabric, a lot brighter and whiter. 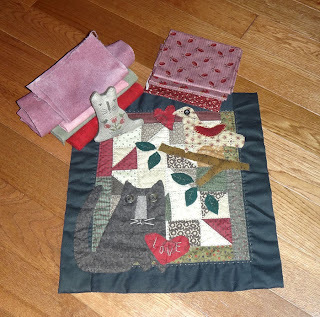 I do like the design and have enough to make a nice lap quilt for next year, good practice for my quilting skills too. And for myself, I repurposed these old ornaments. I washed them with soapy water and then antiqued them. 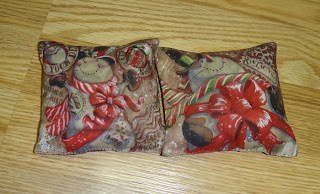 Then I made a little tube from scrap fabrics and filled that with the balsam and put that inside the stocking. Then I hung them on a rack, so I have fresh pine smell in the house. Notice the date, that is when these were originally made. This week I updated my PC Stitch program and realized I had some patterns I was playing with last year. I made a few changes and kept them simple, so you can make them into quick little pillows. I hope you enjoy them and would love to see your finished pieces. I have not tried them, so I hope they work up without any problems. A puppy and kitty, sitting under the tree. You can add an eye with a little french knot. 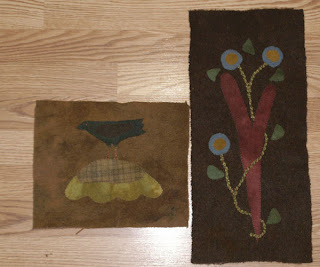 I finished two more pieces today. 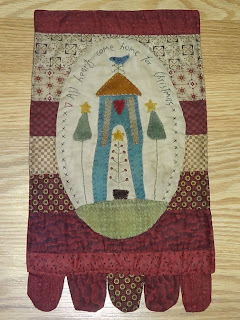 The first is a free pattern called Home for Christmas by Hatched and Patched. 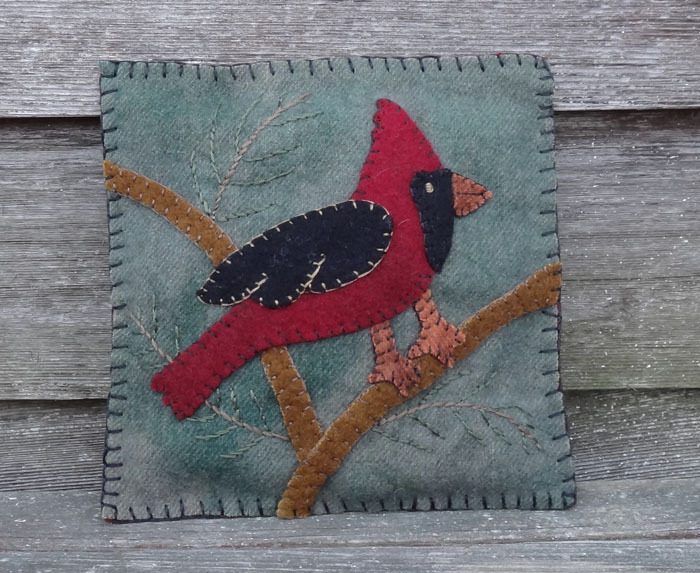 It was a fun piece to make and I used wool for the applique to make it easier. My tongues are a bit whonky though. 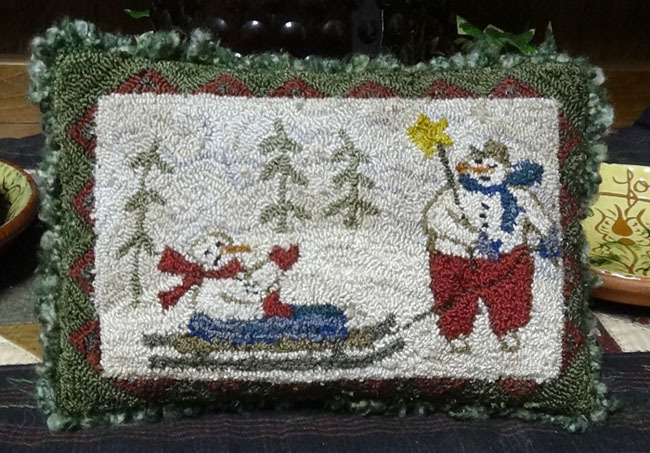 The second is my snowman punch, I ended up making it into a pillow. I like how it came out and pillows are nice since you can sit them on shelves or use in bowls and baskets. The design is by Brenda Gervais. 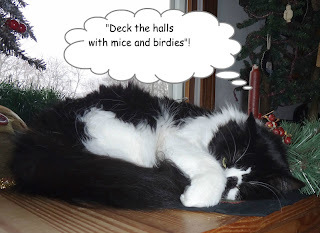 The kitties are being their usual obnoxious selves, pulling down garland, walking off with candy canes and knocking down anything in their path;) And sometimes they are quiet and find a nice cozy place to sleep. 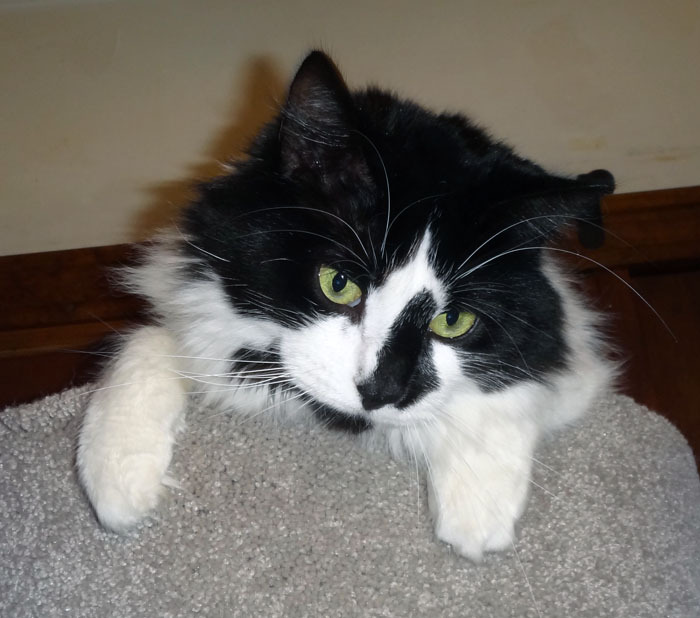 ( Sidenote ) For those of you who voted for Dora in the kitty contest, I want to thank all of you. 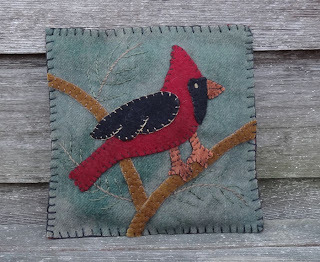 She won second place in the voters choice, so I will be getting some new fat quarters, thread and a round cutter! I have been decorating and that means, digging out old things and reinventing them. 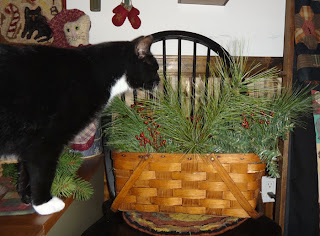 I found this wooden box in a sale rack and it I decided it was perfect to add some greenery to. I picked up the garland after Christmas so a big savings and it is perfect to put in containers and then primp up boughs to fill it out. 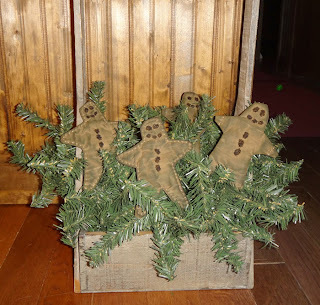 Then I decided to try some gingerbread men from a free pattern from Primitive Quilts and Projects. 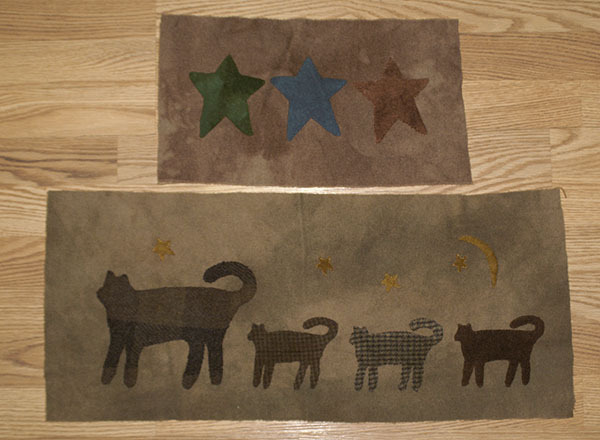 I traced the design out a bit smaller and wider and used wool to make the details. I used a coffee muslim and then stained them with java ink. 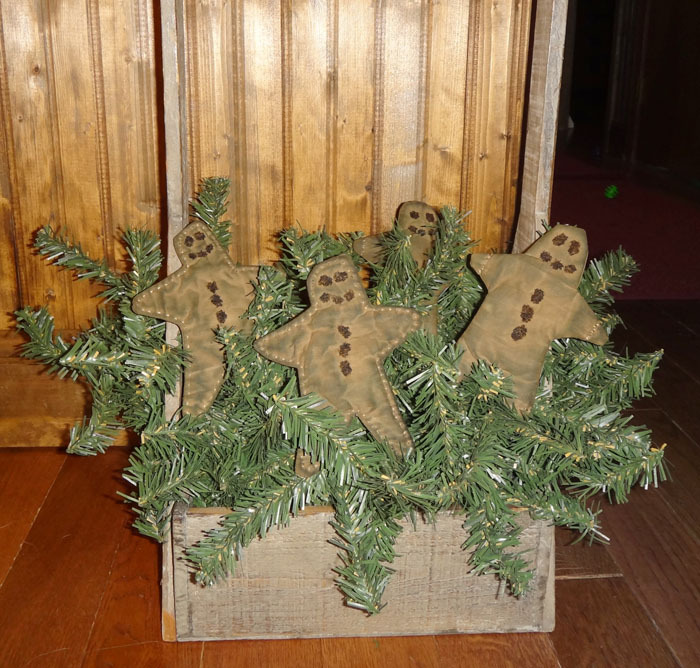 My gingerbread men look as whacky as if I tried making real ones;) I have it sitting on an antique stool, but put it here for the photo. I had to lighten the photo, they are much darker in person. 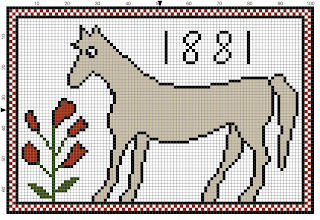 I will add some red berries when I find some more. 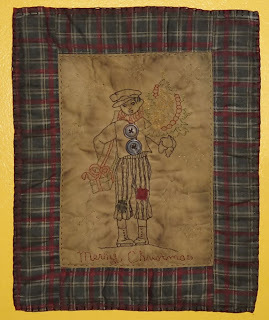 I found this free pattern on Wee Folk Art and thought it would be a fun and fast project. I wanted to use it as a holder for my crushed pine, so instead of stuffing it, I used batting and sewing the crushed pine into the batting. 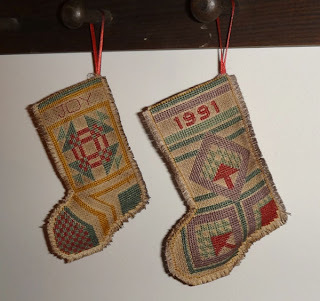 That way I could blanket stitch the piece, without the pine, falling out.